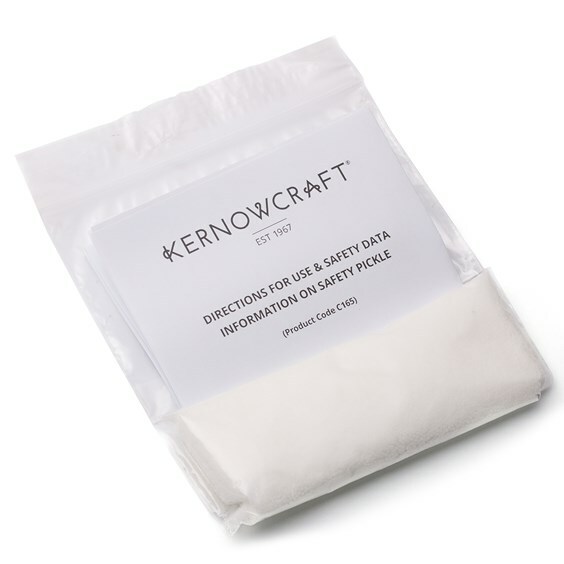 The safety pickle we stock at Kernowcraft has been formulated for the removal of oxides from the surface of precious metal components after casting, soldering, annealing and any other processes involving heat. It is an ideal alternative to the dangerous acids normally used and an essential product for every jewellery workshop. When sterling silver is heated impurities can rise to the surface (especially on larger or flatter pieces) and cause a subtle dark shadow. Sometimes this is obvious straight away but sometimes the staining frustratingly surfaces during polishing. Safety Pickle is perfect for removing the fire-stain caused by heat during soldering. This special dry acid concentrate is safe to store and easy to use. On this page we give instructions on how to use safety pickle as well as the important information you need to know. Always use plastic, brass or copper tweezers as steel can contaminate the solution, causing a chemical reaction which can copper plate your sterling silver. Also make sure all binding wire is removed as this will have the same reaction. Step 1: Heat 1 litre of tap water to approximately 50°C (122°F) in a container capable of resisting acids and caustic solutions (a chemical or polypropylene container is recommended, although glass, most glazed china and most plastics are fine). Step 2: Add approximately 50g of the granules to the water (always add pickle to water, not water to pickle) and stir with a wooden spoon or spatula. To mix a smaller amount, use 250ml of water (approximately 1 cup) and add 12.5g of crystals (approximately 2 level teaspoons). Step 3: Immerse components to be deoxidised in the solution, which should be maintained at 50°C if possible (the heat speeds up the process but is not entirely necessary) and left overnight. Step 4: You can use your safety pickle repeatedly over a number of week. The solution will start to go blue when it is exhausted and needs renewing. Instead of having to heat your pickle up for use every time you want to use it we have found it works fine when dropping hot pieces into the cold solution. Goggles or safety glasses should be worn and any splashes washed off immediately-see below for precautions. Identification of material: Safety Pickle: White powder / flakes / spheres with a light sulphur aroma. Composition: Sodium hydrogen sulphate (a modified salt based predominately on sodium bisulphate). The product is not corrosive if kept dry, but in damp or wet conditions it readily absorbs water, forming an acidic liquid which is mildly corrosive when in contact with skin, eyes or by ingestion or inhalation. Skin Contact: Can be mildly corrosive and cause skin ulceration and dermatitis. Eye Contact: Can be mildly corrosive and cause corneal necrosis and conjunctivitis. Eye Contact: Irrigate immediately with lots of plain water and seek medical attention if required. Ingestion: Rinse mouth out and drink plenty of water. Fire fighting measures: Not considered flammable. Extinguishing media dependant on other constituents of fire. May give off sulphur dioxide fumes so wear breathing apparatus. Spillage / disposal: No specific precautions required. Sweep up powder and collect in a suitable container. Handling / storage: No specific precautions required but, when handling, wear protective mask, gloves, goggles and non-absorbent clothing. Every effort has been made to ensure that the information on this page is reliable but we cannot accept liability for any loss, damage or injury, which may result from its use. Data given in this page is solely for guidance in safe handling and use of its product - it does not form part of any specification. If you have any queries or concerns not covered here, please do not hesitate to contact us. To view our Safety Pickle click here.